Nunzio Torre first appears in the Painesville, Ohio, area in 1921. In America, Nunzio Torre was known as Nunzio Torre. Nunzio Torre was born on September 15, 1873, at Novara di Sicilia. He married Giuseppa Puglisi in 1901. Nunzio died on April 15, 1964, at Novara di Sicilia at age 90. Nunzio Torre, and his family, temporarily moved to Wangen, Switzerland, around 1910 to work construction, building tunnels in the Alps. Nunzio, age 42, immigrated to the United States on June 20, 1916, travelling to Philadelphia, Pennsylvania. He was joining a cousin. Nunzio then migrated to Canton, Ohio, in 1916. He moved to Fairport Harbor, Ohio, in 1921. Nunzio’s daughter, Antonia Giuseppe Torre joined him in Fairport Harbor, Ohio, in 1921. Nunzio settled in Painesville, in 1927. 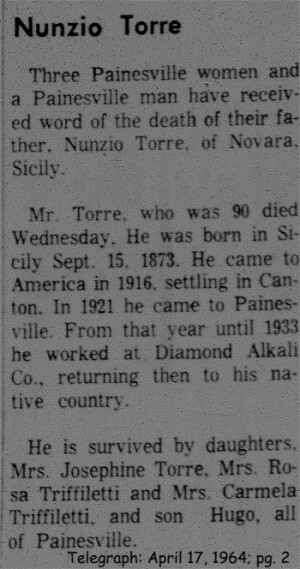 Nunzio Torre became a citizen of the United States on September 29, 1926. Nunzio resided at 713 Eagle Street, Fairport Harbor, Lake County, Ohio, when he was naturalized. Nunzio Torre, returns to the United States on July 12, 1928, travelling to Painesville, Lake County, Ohio. He was escorting his son, Ugo Torre, to Painesville. In December, 1928, Nunzio’s wife, and daughter, Carmela Torre, immigrated to Painesville. His daughter, Rosa Torre, immigrated to Painesville in 1955. Nunzio Torre was employed by the Diamond Alkali Company from 1921 to 1933. Nunzio, and wife, returned to Italy in 1933. 1. Antonia Giuseppa Torre was born on April 16, 1902, at Novara di Sicilia. She married Salvatore Torre, son of Giuseppe Torre and Nunzia DiCarlo, in 1922. Antonia Giuseppa died on August 26, 1983, at Lake County Memorial Hospital, Painesville, Lake County, Ohio, at age 81. Her body was interred at Riverside Cemetery at Painesville, Lake County, Ohio. 2. Rosa Torre was born on March 25, 1905, at Novara di Sicilia. She married Giuseppe Trifiletti. Rosa died on December 30, 1990, at LakeEast Hospital, Painesville, Lake County, Ohio, at age 85. Her body was interred at Riverside Cemetery at Painesville, Lake County, Ohio. Rosa immigrated to the United States about 1955. 3. Carmela Torre was born on December 23, 1912, at Switzerland. She married Antonio Trifiletti. Carmella died on November 15, 2005, at LakeMed Nursing and Rehabilitation Center, Painesville, Lake County, Ohio, at age 92. Her body was interred at Riverside Cemetery at Painesville, Lake County, Ohio. 4. Ugo Torre was born on Saturday August 29, 1914 at Wangen, Switzerland. Hugo lived at the family home in Novara di Sicilia, from age two, until he immigrated to the United States. He first married Margaret Square, daughter of Giovanni Scacciavillani and Anna Antonia Cardegna, on June 17, 1937 at Saint Mary Catholic Church at Painesville, Lake County, Ohio. After Margaret’s death, he married second, Mary V. Garfalo, daughter of John Garfalo and Grace Motzell, on September 24, 1949 at Lake County, Ohio. Ugo died on July 20, 1989 at Richmond Heights Hospital at Richmond Heights, Cuyahoga County, Ohio, at age 74 of cardiopulmonary arrest. His body was interred at Riverside Cemetery at Painesville, Lake County, Ohio.